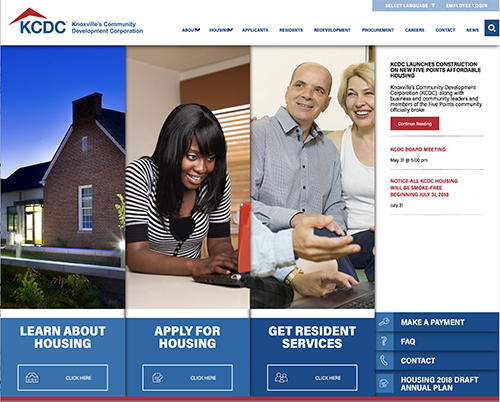 KNOXVILLE - The website for Knoxville’s Community Development Corporation (KCDC) has earned recognition as Website of the Year in 2018 in a statewide competition. The Tennessee Association of Housing and Redevelopment Authorities (TAHRA) announced the winners at the 2018 TAHRA Annual Awards held in April in Murfreesboro. KCDC’s website won in the Extra Large Public Housing Agency category. The judges considered the following criteria: color and design, innovation, content, technology, interactivity, copywriting and user friendliness. The site is now part of a regional competition with members of the Southeastern Regional Council (SERC) of the National Association of Housing and Redevelopment Officials (NAHRO). Moxley Carmichael designed the website for KCDC. Since 1936, KCDC has been dedicated to enhancing the quality of life for the citizens of Knoxville and Knox County. KCDC’s mission is to improve and transform neighborhoods and communities by providing quality affordable housing, advancing development initiatives and fostering self-sufficiency. For more information, call 865-403-1100 or visit www.kcdc.org.